Disclaimer: Bitcoin Magazine has previously run advertisements for Butterfly Labs. This article was written independently of this fact. -Ed. In an upcoming article in our next issue of Bitcoin Magazine, Butterfly Labs, arguably the market leader of manufacturing and selling Bitcoin mining equipment, has released a sneak preview of their current state of development for their ASIC-based Bitforce SC line of computers, scheduled to be released in late November or December. As a sneak peek, we have two images for you. The company has responded to recent criticism with some images. 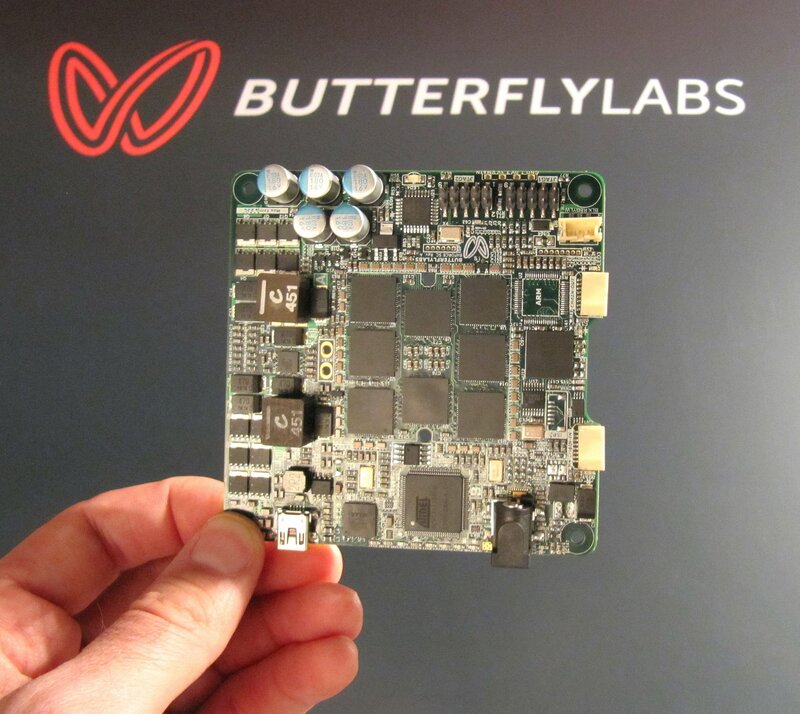 The photo above shows one of the boards in the Minirig SC, the $29,899 version of Butterfly Labsâ€™ product that Butterfly Labs claims will be able to produce 1.5 terahashes per second while consuming only 1500 watts of power. This board, also shared by the Bitforce Single SC, is 92x92mm in size, and holds the entire processing power of a Bitforce Single SC. The Single SC as a whole will have a base area of 98x98mm fully assembled, and will be 74mm high. Each of the eight black squares on the board is a chip capable of computing 7.5 GH/s. Its theoretical maximum output is even higher, but the decision was made to limit the computing power of each chip to provide quieter operation. The Bitforce SC Mini Rig, the $29,899 traditional desktop computer-sized version of the Single, will use the same boards, but most likely with a higher clock rate. The Bitforce SC Jalapeno will use a modified board with only one chip, whose operating capacity is further reduced to meet the limited power availability through the USB bus. Butterfly Labs promises to release more information in the coming weeks, and with the November/December ship date rapidly approaching, eager customers and those watching from the sidelines do not have very much longer to wait.